Looking for something cute to dress up a jacket lapel now that the days are getting cooler? 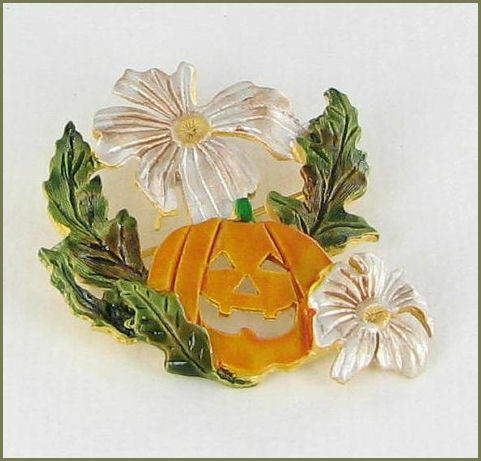 How about this cute Jack O Lantern fall pin? This lovely autumn inspired brooch by AS features an orange jack o lantern sitting in a cluster of green leaves and beige colored flowers. The pin is set in gold tone metal and has a matte finish to the enamel for a very natural look. This item has sold but there are many more seasonal jewelry gift items in my Etsy store – Vintage Jewelry Lane.